I don't know which to rave about first: MINKPINK's done right cheetah print or Sam Edelman's never-fail sandals (...his whole collection is never-fail actually). Or maybe the fun combination of them both is what deserves the hype, with the pop of coral summer-ing up the neutral shades. I just love that these sandals were made to wear with anything, just because it's summer. They're comfortable and they're Sam Edelman, he never does wrong! Also, I'm starting to think the cheetah got it down way better than the leopard. I much prefer its simple, circular, uniform pattern rather than the leopard's rosettes. I've had people ask how to wear such a statement print and I simply suggest that the easiest thing to pair animal print with is a bright color. This will tone the print down and draw attention more to your overall outfit; the print will act complementary. Personally, I tend to add bright colors through my accessories, like these sandals, my over-blogged orange clutch, and even on my lips. But for those wary ones, give a cheetah print a chance. It's actually quite liberating. Omg I can't express how much I love the white blouse with the collar detail....WANT! I love that pop of color from your heels! 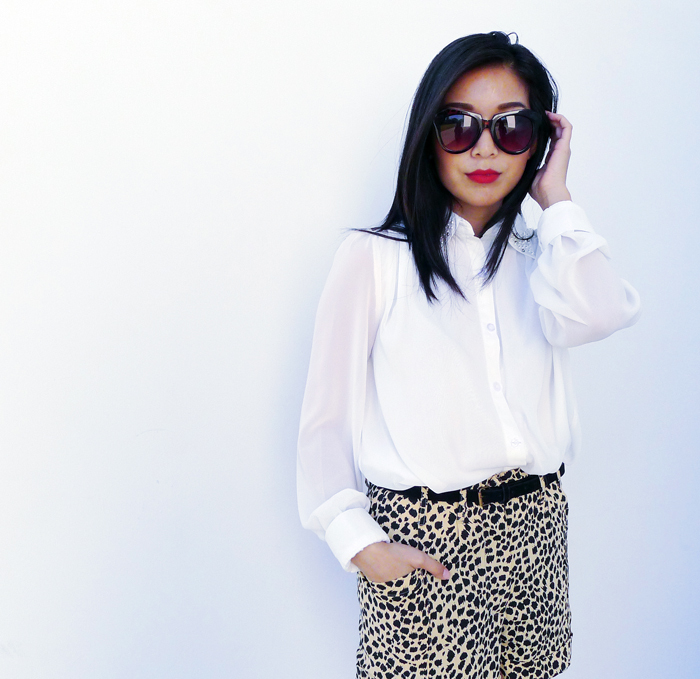 The combo of a classic white blouse and leopard shorts is pure perfection! Such a nice outfit! Love how the colour of your heels match your lipstick! 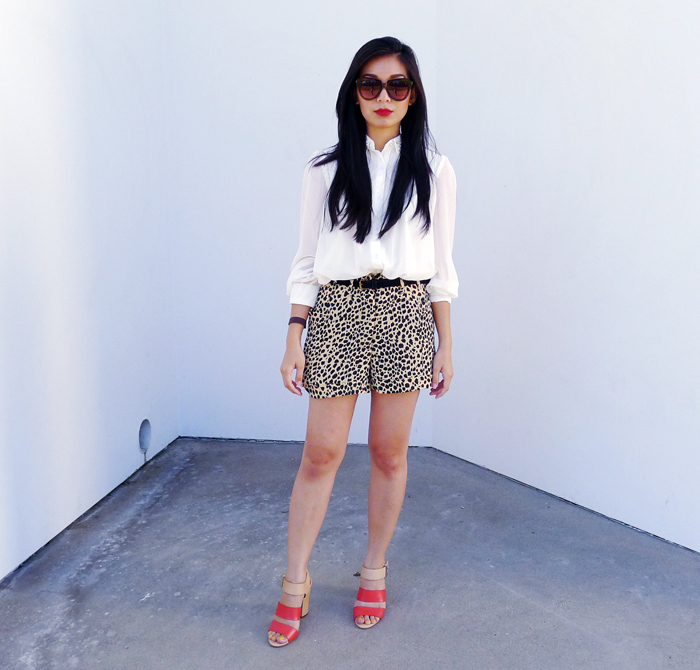 Love how you styled the cheetah print! And those shoes are seriously a never-fail, I love em! Oooo I just looooove the print shorts! And the sunnies as well :] Great look altogehter! Love this chic outfit. Lovely shorts and fabulous sandals! Love the cheetah print~ You styled it perfectly! Love the bright red lipstick too~ Hot! Amazing outfit!! Love your shorts!! The colour red as a lipstick suits you extremely well!! I never would have thought to pair those shorts with those sandals but the look is absolutely killer. I love the belt and short combo too! Love this look the color really does make the look amazing. I love the shirt. Are those pearls on the collar? I love this look!real talk! the white dress shirt with the cheetah print skirt? can you say winning?!?! haha , honestly you look great! I love how tour red lipstick actually plays a role in your overall look as well! I guess if I can take something away from this post , it's all about the details. I love love LOVE this look. Those shorts are amazing! And I'm dying over how cute those shoes are! Very sophisticated. Such a cute outfit! great outfit post, I may have to copy this look! this outfit is amazing! Love the MINKPINK shorts, paired with the button up.